Brake Caliper, Wilwood, Dyna Pro This brake rotor and caliper reduces rotating and unsprung weight. Ideal for use on the rear of asphalt late-models. Steel 5/16” thick brake rotor features lightening slots to reduce excess weight, fits standard 8 bolt, 7” B.C. Wide-5, 5 x 5 and other hubs. 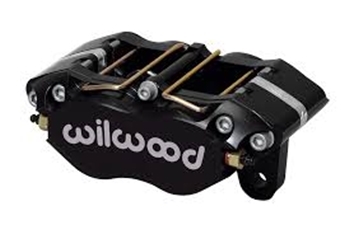 The lite weight forged aluminum, four piston Wilwood Dyna-Pro caliper features 1” pistons to help reduce rear brake bias and uses Hawk HB542 series pads. Fits standard 3-1/2” bolt pattern brackets and 11-3/4” rotors. For rear use only.